John Elway was a tremendous quarterback for the Denver Broncos during his hall of fame career. One would think being so great at the position would grant him the ability to find other great quarterbacks, ergo “it takes one to know one”; Well, unless Brock Osweiler and Paxton Lynch pull a “Space Jam” and steal the talent of real NFL quarterbacks, one would be mistaken. As general manager of the Denver Broncos, John Elway has been downright terrible at finding his next franchise quarterback. To put it simply, John Elway is like the Brock Osweiler of general managers when it comes to finding quarterbacks. If that doesn’t explain the situation well enough, the Broncos selected linebacker Bradley Chubb with the fifth overall pick last year. I would feel more comfortable with him under center than any other quarterback John Elway has wasted a draft pick on. I’ll just say it one more time for you people in the back, John Elway is not good at evaluating rookie quarterbacks. Now that we got that out of the way, the Denver Broncos currently hold the number ten pick in the draft this year. There are four quarterbacks that I believe could land somewhere in the first round, all with the potential to step in and be the number one guy for whichever team drafts them; These players are Dwayne Haskins, Drew Lock, Kyler Murray, and Daniel Jones. Out of the top ten picks, the Giants at 6, and the Jaguars at 7 are in the market for a quarterback. Here is where I’ll make some not so bold predictions. (side note: if this doesn’t happen, just pretend I said the opposite). The Giants will either move up to take Haskins or land him at 6. The Jaguars will have a tough choice between Drew Lock and Kyler Murray. For the sake of this article, let’s say Lock ends up in Jacksonville. Now, this leaves Kyler Murray and Daniel Jones available at pick 10. 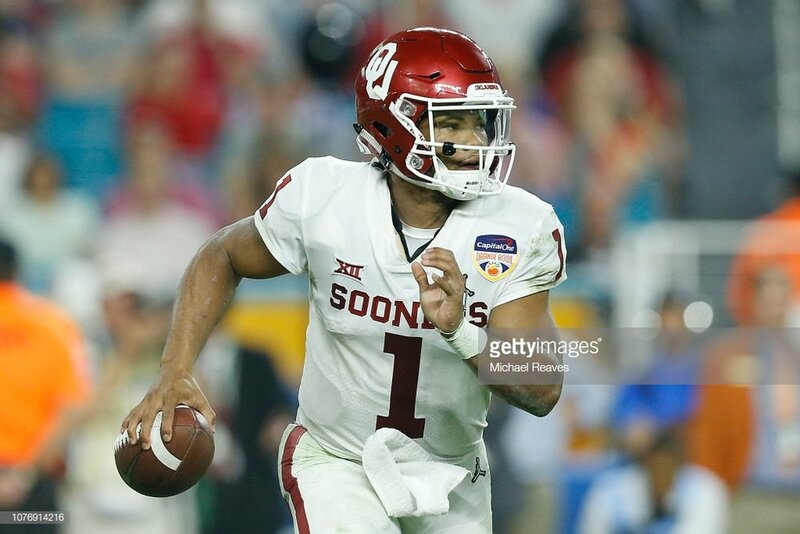 Although Jones had a good showing at the Senior Bowl, Kyler Murray would be the better value from this pick (However don’t be surprised if John Elway selects, I don’t know, Ryan Finley at 10). Let’s stop and see where we’re at for a moment. We addressed the Broncos’ need for a quarterback; We talked about the potential first-round quarterbacks available in the draft; We made our predictions and decided on Kyler Murray to the Denver Broncos at pick 10. Sound good so far? No, well too bad. We’re moving on. Since that’s settled, college football fans will know Kyler Murray as the former quarterback and Heisman winner for the Oklahoma Sooners. In one of the best seasons by a quarterback in college football history, he threw for over 4300 yards and 42 touchdowns, while only throwing 7 interceptions. These stats are impressive enough, but we can’t forget his dual-threat capabilities. He also rushed for over 1000 yards and added 12 more touchdowns on the ground. He did all of this in the Big 12 conference, which is a prominent conference in D-I college football. That is what I believe sets him apart most from guys like Daniel Jones, who played at Duke. Kyler Murray is undersized, but in today’s NFL where the game is faster and quarterbacks often need to get out of the pocket anyway, Murray should be able to adjust (or the team around him can adjust). Other than his size, one of the biggest question marks surrounding Kyler Murray has nothing to do with football. He is such a talented athlete, there’s a possibility he could play Major League Baseball this year instead. As of this writing, no final decision has been made, but it is important to note that this is also a risk with Murray. So, assuming the Broncos take Murray at 10, who are they getting? They would be getting a true dual-threat quarterback that can extend plays with his feet while keeping his eyes downfield to open up plays for receivers like Emmanuel Sanders. He could also run the option with Phillip Lindsay, keeping defenses on their toes. With a mostly solid defense, Kyler Murray has the kind of abilities that can really change the game for the Denver Broncos.